Prospero, long exiled from Italy with his daughter Miranda, seeks to use his magical powers to defeat his former enemies. Eventually, having proved merciful, he divests himself of that magic, his `art', and prepares to return to the mainland. 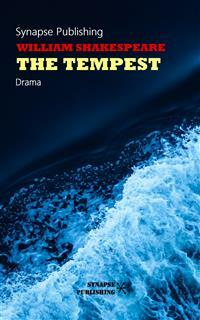 The tempest is one of the most suggestive, yet most elusive of all Shakespeare's plays, and has provoked a wide range of critical interpretation. It is a magical romance, yet deeply and problematically embedded in seventeenth-century debates about authority and power. Performed variously as escapist fantasy, celebratory fiction, and political allegory, The tempest is one of the plays in which Shakespeare's genius as a poetic dramatist found its fullest expression. Significantly, it was placed first when published in the First Folio of 1623, and is now generally seen as the playwright's most penetrating statement about his art. BOATSWAIN. Heigh, my hearts! cheerly, cheerly, my hearts! yare, yare! Take in the topsail. Tend to th' master's whistle. Blow till thou burst thy wind, if room enough. ALONSO. Good boatswain, have care. Where's the master? ANTONIO. Where is the master, boson? keep your cabins; you do assist the storm. hap.-Cheerly, good hearts!-Out of our way, I say. BOATSWAIN. Down with the topmast. Yare, lower, lower! Bring her to try wi' th' maincourse. [A cry within] A plague upon this howling! They are louder than the weather or our office. we are less afraid to be drown'd than thou art. to sea again; lay her off. GONZALO. The King and Prince at prayers! SEBASTIAN. I am out of patience. ANTONIO. We are merely cheated of our lives by drunkards. [A confused noise within: Mercy on us! ANTONIO. Let's all sink wi' th' King. Against my very heart! Poor souls, they perish'd. Lie there my art. Wipe thou thine eyes; have comfort. Which thou heard'st cry, which thou saw'st sink. Sit down, for thou must now know farther. PROSPERO. By what? By any other house, or person? How thou cam'st here thou mayst. PROSPERO. Both, both, my girl. Which is from my remembrance. Please you, farther. MIRANDA. O, good sir, I do!